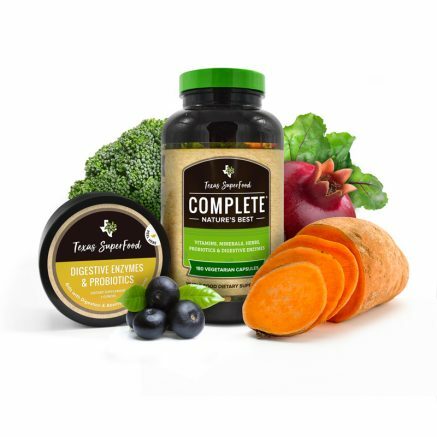 Whole Food Nutrition. A Simple Solution. 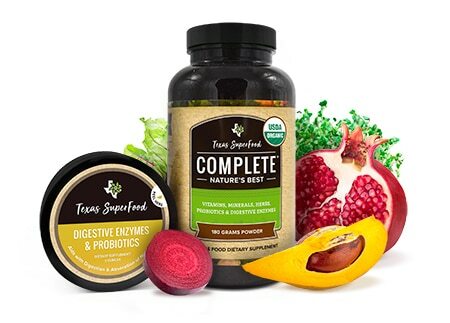 Our flagship product, Texas Superfood, is a whole food dietary supplement that’s made from a special combination of 55 raw, vine-ripened fruits, vegetables, algae, herbs, grasses, and enzymes. 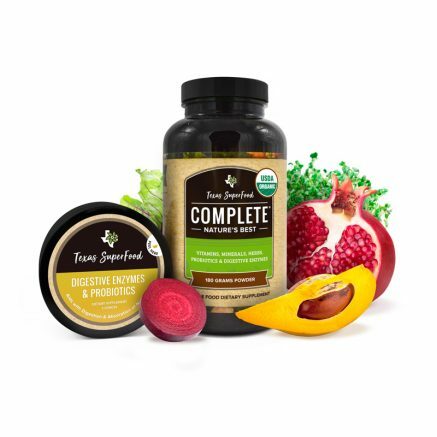 This potent mix of nutrients helps support your physical energy and performance, quality of sleep, mental focus, balanced weight, clear skin, and elevated mood, and also reinforces organ health and function. †These statements have not been evaluated by the Food and Drug Administration. In Stock. Ships within 3-5 Business Day. Subscribe & Save Save $5.00 and Receive FREE EXPRESS SHIPPING. 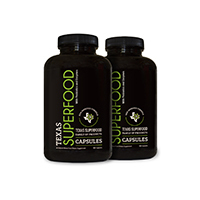 Texas SuperFood Capsules is designed to give your body the nutrition and benefits from nutrient-rich fruits and vegetables, plus the added benefits of probiotics and digestive enzymes†. 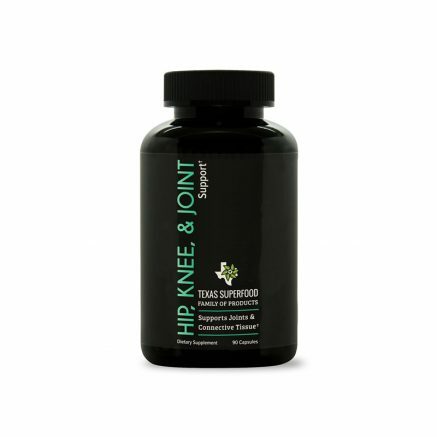 2 or more capsules three times daily, preferably with food. 1 or more capsules three times daily, preferably with food. All of our products are made with the highest quality ingredients available. What's truly important is all of our products are produced in GMP certified manufacturing facilities. Not a good sourece of fat. Suggested Use: 2 or more capsules three times daily, preferably with food. For best absorption, take small dosage multiple times a day. The ripeness of a fruit or vegetable doesn’t just affect its flavor. If the food is picked from the vine too early, it greatly reduces its nutritional value. 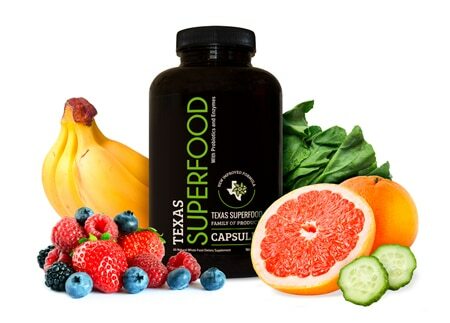 For Texas SuperFood, we only pick vine-ripened fruits and vegetables that have reached the maximum level of nutrition. We harvest our produce right when it’s bursting with life-giving energy and nutrients. That level of abundant nutrition goes straight into Texas SuperFood, and then directly into your body! Too busy to eat your fruits and vegetables? Keep in mind that your body needs all the vitamins and minerals that vine-ripened fruits and vegetables provide on a daily basis. That’s why Texas SuperFood is so great you can get that extra boost of nutrition fast, fueling your body and mind for the entire day! Many nutritional supplement manufactures heat or cook their product. Not us! Most grocery stores put produce out on their shelves that hasn’t even come close to reaching maximum ripeness. Not us! 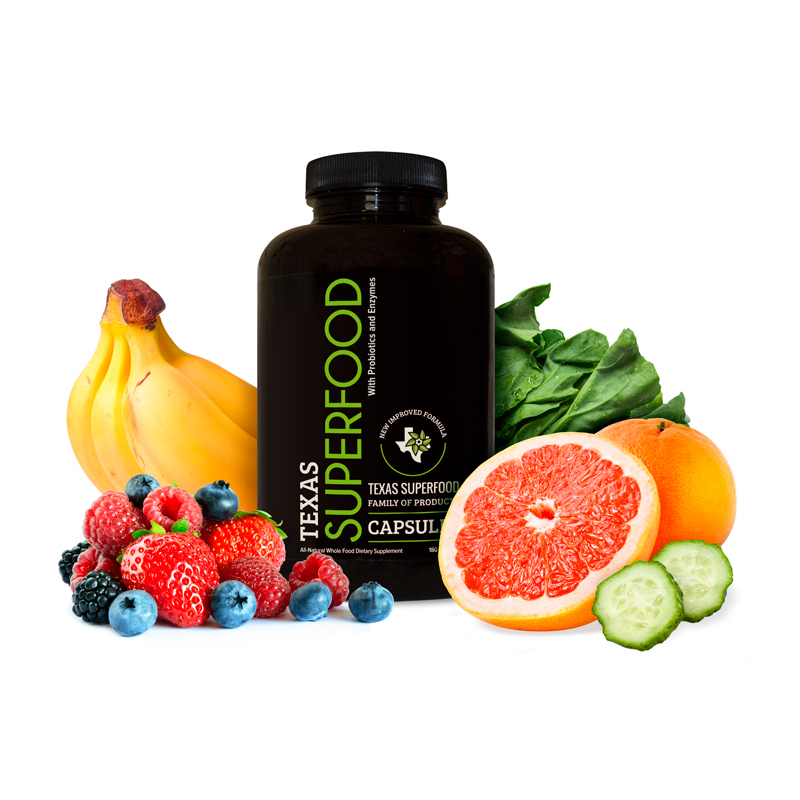 We only use produce that has reached vine-ripeness so that Texas SuperFood delivers the maximum amount of nutrition for a very affordable price. For less than the cost of 2 pieces of organic fruit per day, you’ll get all of the vitamins and minerals from 55 different vine-ripened fruits and vegetables! I have been using this for the past 60 days and notice a marked increase in my energy level! Recommended for anyone who, like me, does not eat fruits of vegetables. It’s a texture thing with me. I rarely drink caffeine these days, and have all the energy I need. Texas Super Food, give it a few weeks to work and you will never quit taking. I own 2 companies and have lots of stress, little time and remain in great health at 63 years old. Just keep making a great product. 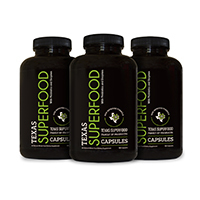 I’ve been taking Texas Superfood for a couple years now and have not been sick a single day since. This has not gone unnoticed by the people in my office. I recommend Texas Superfood. We love our “Texas SUPERFOOD”. We have used the product for several years now, and we cant imagine not always using it. We are both over 55, and we feel like we are in our 30’s.. I believe in DR Black superfoods. I love that they are organic and contain a variety of foods. I try to eat healthy but don’t always do. I take the capsules to ensure my body gets what it needs. I have been taking this for over 5 years. 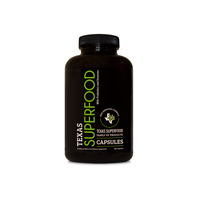 Since starting Texas SuperFood, I can honestly say I haven’t been sick. It is another line of defense for good health. Love the upgrade to the product this year!!! Texas Super Food is an essential part of our daily routine of multi vitamins. It jump starts everything we take for better health. Completing the vitamins and minerals we are not getting. We love it! is so easy it's scary. We thank you for signing up for our Newsletter and future marketing emails. You will receive a confirmation email shortly.